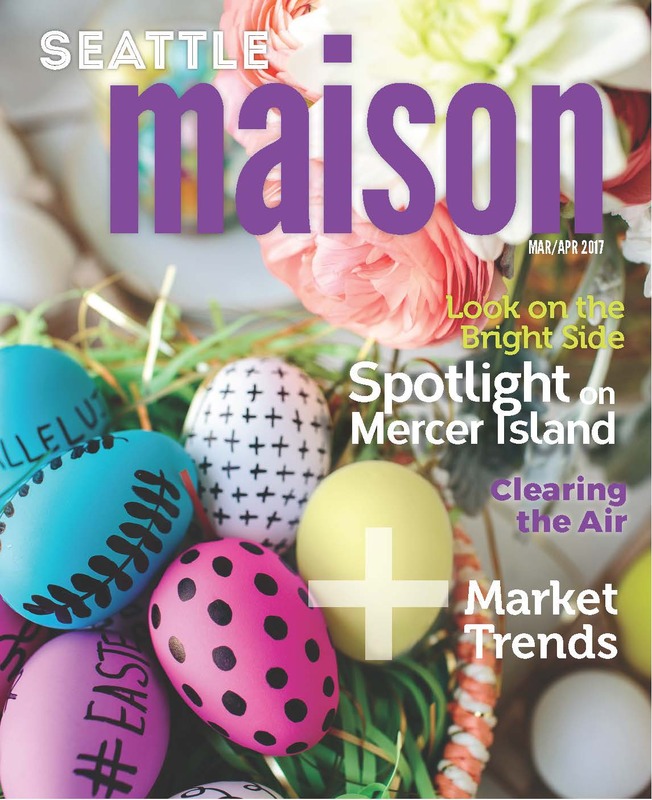 Seattle Maison Magazine: Spring 2017 Issue! I know I say this just about every time a new Seattle Maison debuts, but I think the Spring 2016 issue just may be the BEST version yet! I love, LOVE the fresh topics, and this issue features a spotlight on my favorite stomping grounds around Mercer Island! Bold colors, geometric patterns, splashes of jewel tones and vibrant blues – these trends are hot right now. In the article, Looking On The Bright Side, you’ll get the scoop on how to incorporate over-sized art pieces, wall paper, and splashy accent pieces into your current décor. I’ve been drooling over all the photo examples in the article. Oh my! The March/April issue also includes a fabulous article featuring 7 plants that look beautiful in your home and will help purify the air. Formaldehyde is one VOC producing chemical that is commonly found in household products, building products, and furniture. It’s also one of the toughest to dispel from your abode. The 7 plants discussed in the article not only purify air of a variety of toxic chemicals, they are all champs at removing Formaldehyde emissions. As always, Seattle Maison includes local housing market stats, to keep you in the loop on our red-hot, fast-paced real estate landscape. March has definitely been a lion so far – wet, rainy and cold. Let’s hope that the second part of these saying – out like a lamb – arrives soon! I’m definitely looking forward to warmer days, gentle spring breezes off the lake, and sunshine! Until then – delve into the wonder of color within your home and dabble with some the techniques shared in the pages of Seattle Maison magazine! Want to receive your own copy, emailed when the magazine is “hot off the press?” Email me at kathryn@windermere.com to sign up.